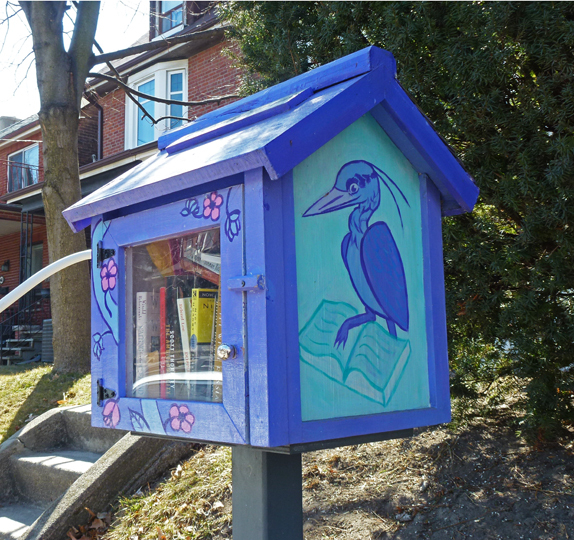 I'm not sure what kind of bird that is supposed to be on this Little Library but he/she likes books! There was a nice assortment of books in this one. ...if it were here, it would be covered with snow today! That bird, I believe, is a heron. Herons in Florida are noted readers but most of them I've talked to prefer to watch cartoons, in particular, Road Runner cartoons. I don't know why. This is a very cute little library and I'll refrain from comments about it being "for the birds." I'll call it the blue bird of readers! Very nice! Cheerfully painted! I like the colour. Looks like the bird ate the bookworm. Hello, I love the bird, cute library! Happy Thursday, enjoy your day! My first thought was a heron but I really have no idea! I love the Little Free Libraries. I love these wee free libraries. We just put a bunch of books in ours last week and they are already gone. A lovely little library. These are such fun, both the box and its contents. What a lovely little library, Pat ! I like also the reading bird . I love seeing these all around, and the bird is a nice touch. I also noticed no snow!